Utrecht is one of the main cities of the Netherlands and lies 45km south of Amsterdam. Please see how to get to Utrecht for information on arriving by train or coach and getting oriented at Utrecht Central Station. Once in Utrecht, let’s take a look at how to get around the city by various forms of public transport – including buses, trams and trains as well as foot, bicycle and taxi. The cheapest and easiest option, Utrecht city centre is small enough so that the majority of visitors can quite easily get around on foot. From Utrecht Central Station you can access the city centre by walking via the new covered pavilion square at Stationsplein-Oost (located past platforms 1-4) and then into the Hoog Catharijne shopping centre. After a few minutes walk you will reach the exits at the Vredenberg square. From here you can make your way to the Oude Gracht (old canal) and imposing Dom cathedral tower at the heart of the old centre. Just watch out for the cobbled streets and cyclists! There is a U-OV sneltram light-rail service from Utrecht Central which runs to the satellite towns of Nieuwegein and IJsselstein, a few kilometres south of the city. It is perhaps not of great use to visitors. The tram is also used by people visiting the Utrecht IKEA store – a short walk from stop Kanaleneiland Zuid. OV-chip cards must be scanned at readers on the tram platforms rather than on board. A new 7.5km tram line extension from Utrecht Central to the university campus at Science Park De Uithof is currently being built and tested. It should be fully operational by the end of 2019. It will replace some existing bus services and the tram line will include a stop at Utrecht FC football stadium. Tickets are the same as for U-OV buses, described below. These can be useful if you need to head to the outer areas of the city. Buses are operated by U-OV (a subsidiary of Qbuzz, now owned by Italian State Railways) which runs around 30 bus lines around the city. There are bus terminals at opposite ends of Utrecht Central Station – known as City-side and Jaarbeurs-side. Bus stops in the city have electronic boards which give live info on the next departing buses. Some places of interest to visit which may require a bus ride are the Rietveld Schroder House museum (line 8) and Utrecht FC Galgenwaard football stadium (line 12 or 41). In addition, minibus line 2 is a useful circular route which travels around the museum quarter. Utrecht Bus/Tram Tickets: A one-time single (U-OV reiskaart paper ticket) within the city costs €2.90 (2019) – this can be bought on-board and is stamped by the driver. It is also available at U-OV sales points/ticket machines at Utrecht Central. 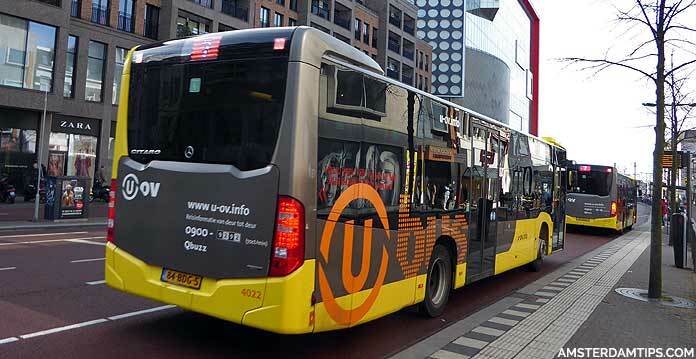 After 1800 on Thursdays and Fridays and over the whole weekend, the single U-OV reiskaart can be used as a return ticket. Longer-stay visitors could consider one of the U-OV Utrecht City day tickets, available as disposable OV-chip cards. You have the choice of 1 day/24 hours (€6.20), 2 days/48 hours (€9.25) or 3 days/72 hours (€11.85). Special day tickets for children aged 4-18 are offered – these are around €2.10 cheaper than the adult tickets. Children 0-3 ride public transport for free. Note, U-OV no longer accepts cash on-board, you must pay by debit card. The day tickets are valid in the Utrecht city area (including Leidsche Rijn, Uithof and Kasteel de Haar) and can be bought at the U-OV travel shop/ticket machines at Utrecht Central. There is also the Utrecht province day ticket available which costs €8.25 and is valid on U-OV and Syntus buses/trams in the entire region. Note, this can only be placed onto an OV-chip card (OV-chipkaart), the public transport smart card system. You can use credit on a personal or anonymous OV-chip card to travel on any U-OV service. This costs €0.90 (boarding fee) + €0.143 per km. You must always check-in and check-out of your journey using the card readers next to the doors. Taxis in the Netherlands are expensive and you will likely pay €10 to €20 for a short trip in the city. There are 2 taxi ranks at Utrecht Central station – at the Jaarbeurs-side and at the city centre side (Rijnkade). You can also find small taxi ranks at Janskerkhof, Lange Viestraat, Mariaplaats, Neude and Stadhuisbrug. The main taxi firm in Utrecht is UTC (tel +31(0)30 2300 400). Note, there is no official Uber presence in Utrecht. Having a large student population, cycling in Utrecht is very popular with an extensive network of dedicated cycle lanes. In fact, the busiest cycling path in the country can be found next to the Tivoli-Vredenberg theatre. In addition, the largest bike parking facility in the world has opened at Central Station, which has a capacity for 12,500 bikes. Bikes are available for rent at the Tourist Information Centre at Domplein 9. There are OV-Fiets bike rental points (residents only) at Utrecht Central station, Mariaplaats and Janskerkhof.